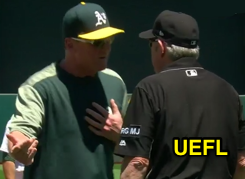 2B Umpire Mike Winters ejected A's Manager Bob Melvin (base award/runner placement) in the bottom of the 2nd inning. With one out and two on, A's batter Josh Phegley hit a 0-1 fastball from Red Sox pitcher Drew Pomeranz on the ground to catcher Christian Vazquez, whose throw to first base was wild and bounded out of play by lodging in the right field bullpen. * Accordingly, the umpires awarded the batter-runner and base runners two bases from their location at the time of the pitch, pursuant to Official Baseball Rule 5.06(b)(4)(G), the call was correct. At the time of the ejection, the Red Sox were leading, 2-1. The A's ultimately won the contest, 8-3. This is Mike Winters (33)'s first ejection of the 2017 MLB regular season. Mike Winters now has 3 points in the UEFL Standings (-1 Previous + 2 MLB + 2 Correct Call = 3). Crew Chief Mike Winters now has 2 points in Crew Division (1 Previous + 1 Correct Call = 2). *According to Oakland Coliseum Ground Rules, a ball lodging on, under or in the bullpen seating area is Out of Play. A ball is considered "lodged" when, in the umpire's judgment, it is unplayable. ^Rule 5.06(b)(4)(G) states, "Each runner including the batter-runner may, without liability to be put out, advance—two bases when...a thrown ball goes into the stands, or into a bench [bullpen]...When such wild throw is the first play by an infielder, the umpire, in awarding such bases, shall be governed by the position of the runners at the time the ball was pitched." This is complicated by the Oakland Coliseum's large playing surface. 5.06(b)(4) Approved Ruling: "The term 'when the wild throw was made' means when the throw actually left the player’s hand and not when the thrown ball hit the ground, passes a receiving fielder or goes out of play into the stands. The position of the batter-runner at the time the wild throw left the thrower’s hand is the key in deciding the award of bases. If the batter-runner has not reached first base, the award is two bases at the time the pitch was made for all runners. The decision as to whether the batter-runner has reached first base before the throw is a judgment call." This is the 41st ejection report of 2017. This is the 22nd Manager ejection of 2017. This is Oakland's 2nd ejection of 2017, T-1st in the AL West (OAK, TEX 2; SEA 1; HOU, LAA 0). This is Bob Melvin's 1st ejection since July 15, 2016 (Mark Wegner; QOC = Y [Balls/Strikes]). This is Mike Winters' 1st ejection since March 24, 2017 (Avisail Garcia; QOC = U [Balls/Strikes]). Wrap: Boston Red Sox vs. Oakland Athletics, 5/20/17 | Video via "Read More"